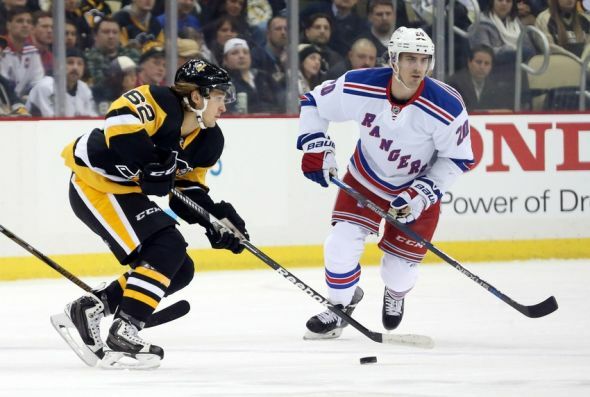 The Stanley Cup Playoffs kick off tonight in Pittsburgh with Game 1 between the Penguins and the Rangers. For the first part of the year, it was questionable whether or not the Pens would be able to find themselves alive to play at the beginning of the postseason, let alone starting off with a home game and finding themselves among the favorites to win the Stanley Cup, but it's been a remarkable turnaround under Mike Sullivan. Sullivan will attempt to further right the ship by doing something neither of his two predecessors was able to accomplish - beat the New York Rangers in a Best of 7 series. To do so, the Penguins will need to get pucks behind Henrik Lundqvist. The Rangers are the 16th out of 16 teams in possession on the season with a 48.2 SACF%, and they've been trending downward to finish out the regular season. Having an elite goaltender like Lundqvist helps to mitigate the possession disadvantage, though his 0.920 SV% and 2.48 GAA are some of the worst numbers of his career, suggesting that New York's decline in driving play could be catching up to the goalie. Lundqvist will have his hands full in the first round, as not only have the Penguins been one of the best teams of late at forcing play into their opponent's end of the ice, they were the third highest scoring team in the league this season with 2.94 goals per game, and that average has been trending upwards over the past month. The Penguins have had good success against Lundqvist the last few times they faced him, and they'll look to continue that into the playoffs. The Rangers will have a big advantage in goal if neither Marc-Andre Fleury nor Matt Murray are able to suit up for the start of the series. Fleury has practiced the past two days, but he has yet to get medical clearance for game action, while Murray has been announced as day-to-day with an upper body injury. The schedule benefits the Pittsburgh goalies, as well as the rest of their injured skaters, as the first three games are spread out over the course of seven days. The light schedule will also help out Rangers captain Ryan McDonagh, who has been out injured with a broken hand. The injury leaves New York thin on the blue line, and it gives them a top pairing of Marc Staal and Dan Girardi that will have a very difficult time matching up with Pittsburgh's top lines. The Rangers have managed to get good goal scoring out of their top two lines all season long, as five of the six forwards hit the 20 goal plateau on the season. The one who didn't, surprisingly, was Rick Nash. After scoring a career high 42 goals last season, Nash followed up with a career low 15 goals this year, and it's fair to wonder how much the 31 year old might have left in his tank. While Nash's production is down, the players around him have stepped up, and Mats Zuccarello and Derick Brassard have formed a potent combination on the second line. Zuccarello led New York with 61 points on the year, while Brassard had a team-best 27 goals. - The Penguins will be wearing their alternate Pittsburgh Gold jerseys for each home game of these playoffs. - Justin Schultz, Tom Kuhnhackl, Conor Sheary, and Oskar Sundqvist are all expected to make their NHL playoff debut tonight, while a handful of others will be making their first postseason appearance as a Pittsburgh Penguin. - Sidney Crosby is 7th all-time in postseason point per game average with 1.18 pts/gm, scoring 43 goals with 75 assists in 100 career appearances. Not far behind is Evgeni Malkin in 13th place, with his 42 goals and 69 assists in 101 playoffs games giving him a 1.10 pts/gm average.